You can set WAPT Pro to create full logs or failed sessions logs. Log files will help you know what occurred during test run. Switch to the Log Settings view and select the type of log file in the Level of detail combo-box. Full log is a comprehensive log of WAPT Pro test run that includes information on all requests, responses, redirects and returned HTML code. Note that creation of full logs may require much space on the disk. Full logs are often used for functional testing or verification of test scenario with dynamic parameter values. If you set WAPT Pro to create full (failed sessions) logs, then the corresponding log file will be created for each virtual user participating in the test. Also you can create a full log for the first user of each profile and failed sessions logs for other users (or disable logs for other users). 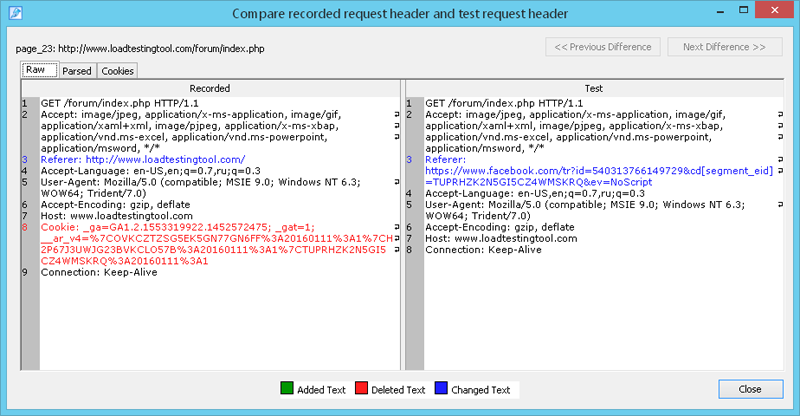 Users' logs are saved on the computer running Load Agent that generated the load during the test. If you use several agents in your test, then each of them creates logs for virtual users that it generated. Users' logs are saved to the folder specified in the Load Agent Manager (Store test data files in edit-box). 1_000_0.log is a full log for the first user of the second profile. Here the first number is the number of user profile, the second is the number of virtual user, and the last is the number of user's startup in case of periodic user load. Note that WAPT Pro begins to count the number of profiles/users from zero. When you open the Logs folder of Navigation Pane, WAPT Pro workplace downloads users' logs from agents and displays information in the Logs tree view. The workplace component saves the downloaded logs to the default location which is specified in General settings (Save log files to edit-box). The next time you run a test, logs may be overwritten by new log files. If you wish to use the generated logs later, you can save them manually by clicking the Save Logs... option on the File menu. You can open logs by clicking the Open -> Logs... button on the program toolbar. In the displayed dialog, select a desired folder with log files and click Open. WAPT Pro will parse log files from the selected folder and display the information in the Logs tree view. Note. Do not modify log files or their names manually. Otherwise, you will not be able to open them in WAPT Pro. You can use an additional toolbar under the Navigation Pane to browse virtual users, user sessions and errors one by one. Additional toolbar becomes active when you click on any item of the Logs tree view. Below is the example of full log. In the upper right pane you can see the sent requests and received server responses. Request is green highlighted if it was processed without errors, or red highlighted if there were errors. Show all events occurred within the request timeline: If you check this option, the log view will show all events occurred within the time interval of request execution - both relating and not relating to the current request. Uncheck this option to hide events not relating to the current request. Show details: If this option is unchecked, the log view shows only successful and failed requests. They are highlighted with the green or red color correspondingly. All other events (not highlighted in the list of events) are hidden in this case. You can check this option to show all requests and events. Show absolute time: Using this option you can switch between the absolute time (the local time on computer running WAPT Pro workplace component) and time passed from the beginning of test run. There is a special row Values of variables above the main request. If you click it, you will see the list of variables created during this session for the current page and all the previous pages. Next to each variable you can see its current value. Note that if some variable is not actually used for parameterization of requests, it is not created during the test and is not represented in user's log (except for verification tests where all variables are created during the test and shown in the log). If you used several IP addresses for your test (IP spoofing feature), then user's log would show which of IP addresses was used for execution of the current user session. The lower pane has several tabs where you can see the request/response details. Request Header: Here you can see the HTTP header of sent request. You can select different representations in the "View as" combo-box: "Binary" (to view the data in the binary form), "Text" (to view the data in the text form) and "Url parameters" (to see the list of URL parameters). Request Body: The body of sent request is shown on this tab. You can select different representations in the "View as" combo-box: "Binary" (to view the data in the binary form), "Text" (to view the data in the text form) and additional option for POST requests: "Form Data" or "Multipart Form Data" depending on the type of POST request. Response Header: Here you can see the HTTP header of server response. You can select different representations in the "View as" combo-box: "Binary" (to view the data in the binary form) and "Text" (to view the data in the text form). Response Body: The body of server response is displayed on this tab. You can select different representations in the "View as" combo-box: "Browser View", "Binary", "Text" and "Json". If you select "Browser View", you will see the server response as it is displayed in browser without images. If the displayed web page has incorrect language encoding, you can select another encoding for it. In case you select the "Text" representation on these tabs, you can search for some text string in the html code. Find: Type the text that you want to find. The program will highlight all occurrences of the entered text. Use the Previous and Next buttons to move to the previous/next occurrence of the text. Recorded Messages: This tab shows the sequences of incoming and outgoing messages recorded for current request. For each message you can see its time of recording calculated from the beginning of the test. If you add operators to the sequence of requests, WAPT Pro will log their work as well. log.error (writes an error message to the log). For this operator the log indicates that there is a group of pages relating to the same business action (transaction) at that place. For this operator the log indicates that execution of the current session was stopped at that place. For this operator the log indicates that test execution was interrupted at that place. When browsing logs you can compare requests and responses saved during the test run with the initially recorded ones. This feature can be used to determine the data that is unique for each session and parameterize corresponding requests correctly. 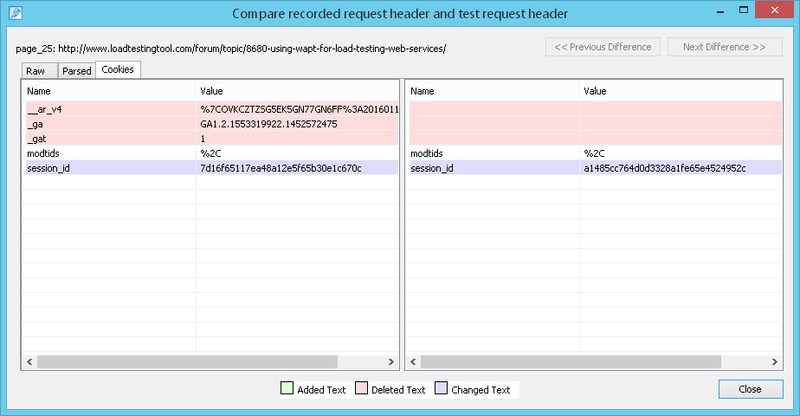 You can compare request/response headers and bodies. Select the corresponding tab (Request Header, Request Body, Response Header or Response Body) and click the Compare with recorded... button. 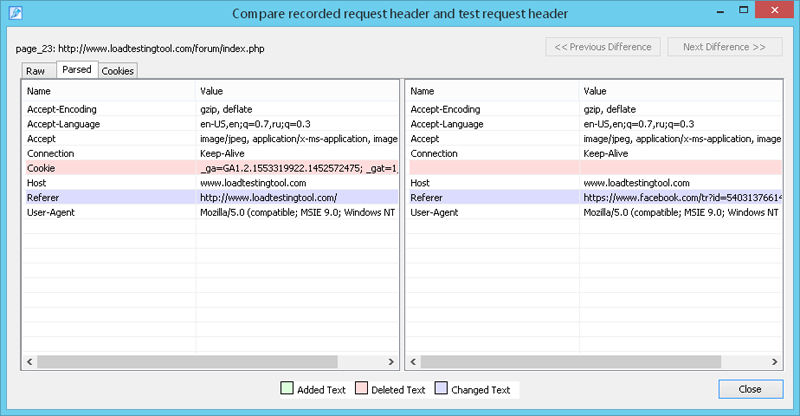 In the displayed window you will see the differences between the recorded and test request/response headers or bodies. If they are identical, you will see the corresponding message. The legend at the bottom of the dialog shows which colors are used for added, deleted and changed text in this view. Added text is a text which is present only in the right pane. Deleted text is a text which is present only in the left pane. Changed text is a text which is different in these two panes. If recorded and test headers are the same, but have different location in the text, such headers are considered identical. Use the Previous Difference and Next Difference buttons to browse differences one by one.